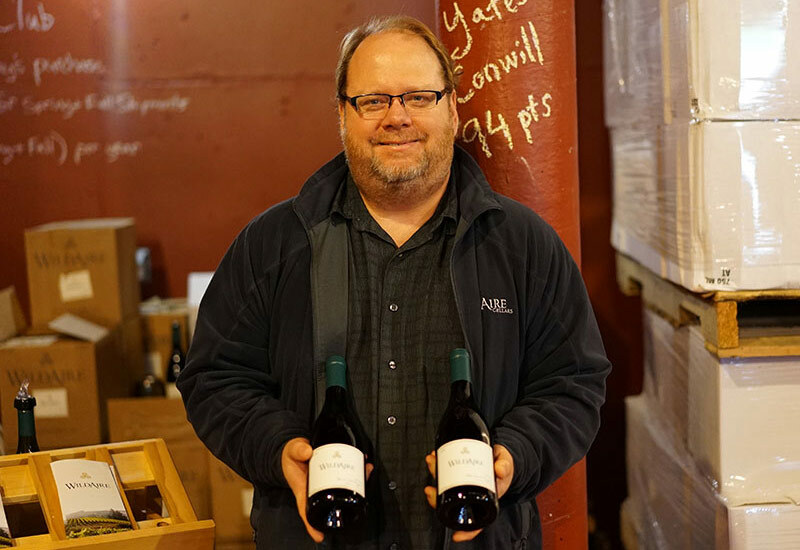 WildAire was founded with love in 2005 by Matt and Jean Driscoll after years of immersing themselves in the Willamette Valley wine scene. They started the journey 21 years ago by a chance visit to Oregon to attend a friend’s wedding and their destiny was sealed. 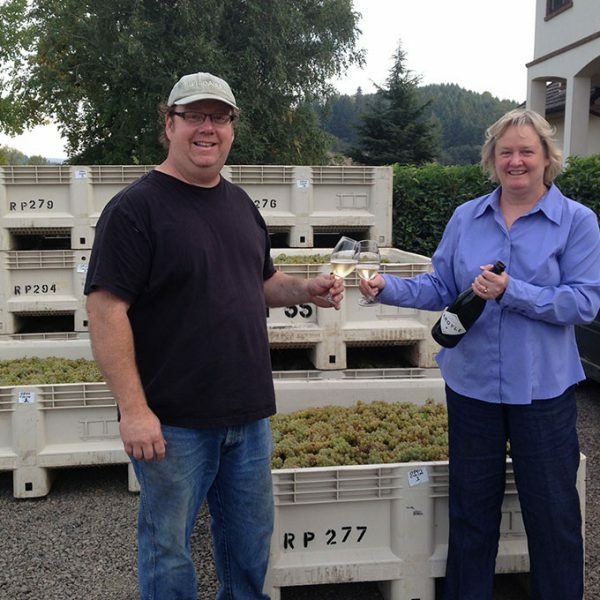 After getting married in 2000, they moved 3000 miles from Virginia to learn all aspects of the wine business in Oregon. 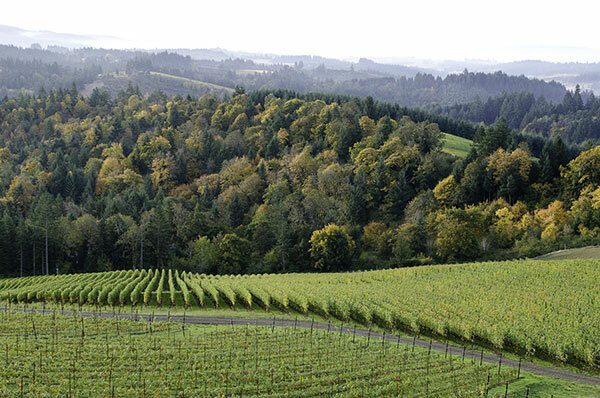 Their time in the Willamette Valley began by studying winemaking, farming, and marketing Pinot Noir at the Northwest Viticulture Center and by working with some of Oregon’s top winemakers. 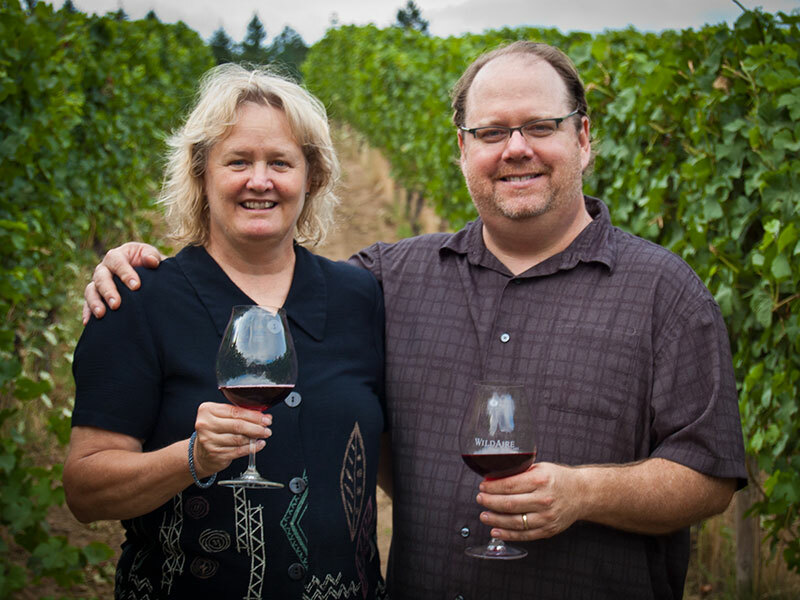 WildAire was founded with love in 2005 by Matt and Jean Driscoll after years of immersing themselves in the Willamette Valley wine scene. They started the journey 23 years ago by a chance visit to Oregon to attend a friend’s wedding and their destiny was sealed. 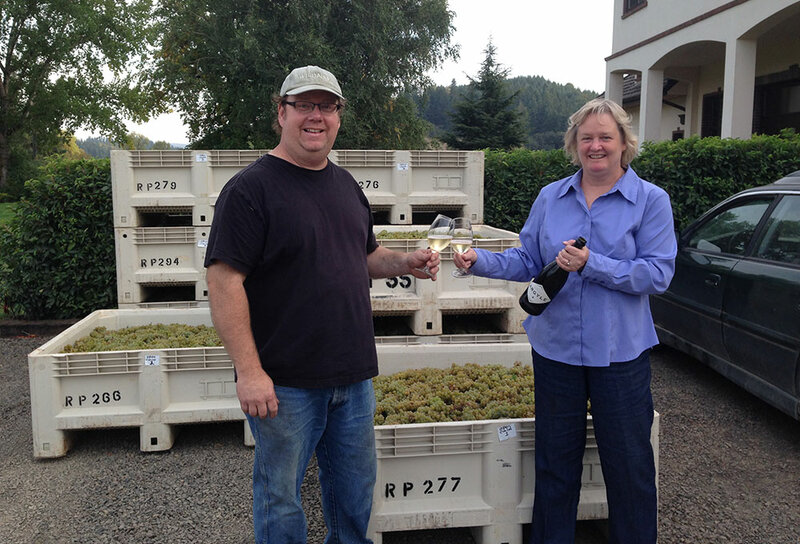 After getting married in 2000, they moved 3000 miles from Virginia to learn all aspects of the wine business in Oregon. 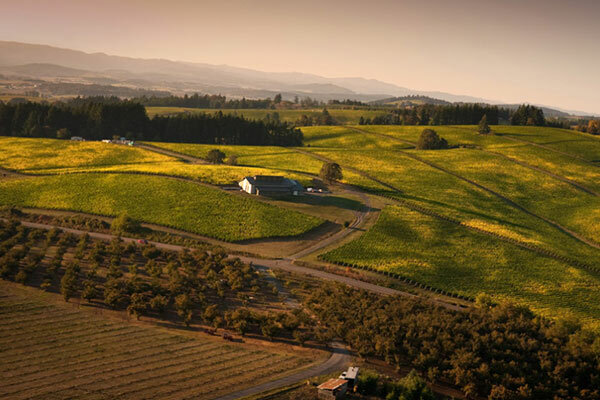 Their time in the Willamette Valley began by studying winemaking, farming, and marketing Pinot Noir at the Northwest Viticulture Center and by working with some of Oregon’s top winemakers. 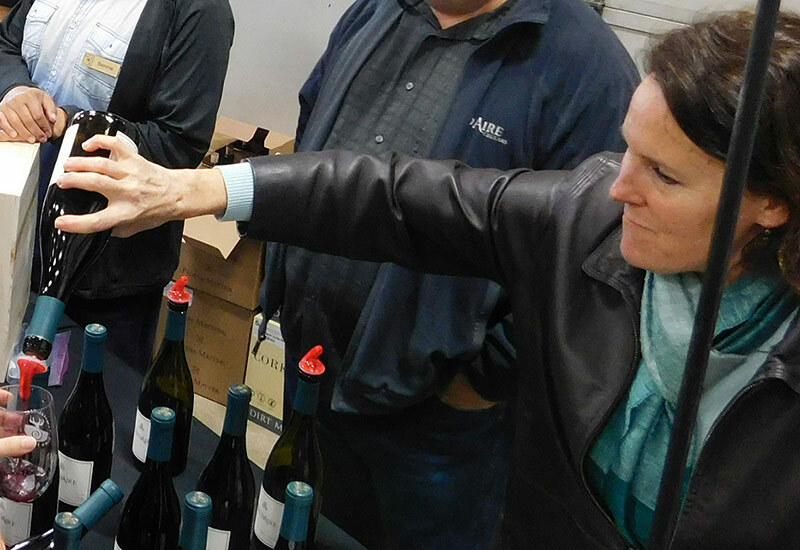 Matt has 18 vintages of winemaking experience and oversees the production for WildAire while Jean focuses on the sales, marketing, and financial side of the family business. 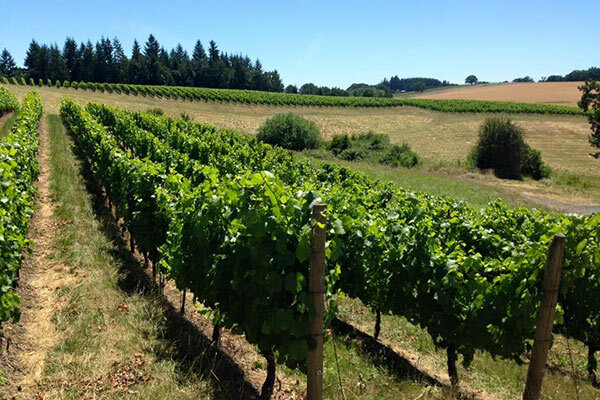 Their vision is to create elegant wines with love and passion that are acid driven and food friendly using fruit grown from some of Oregon’s greatest vineyard sites. 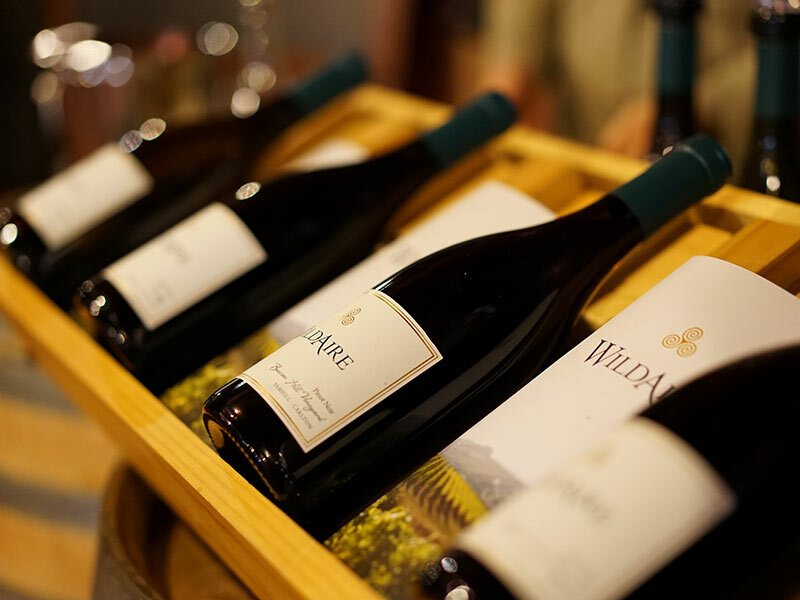 WildAire’s first year of production was approximately 70 cases of wine and has now grown to 500 cases. 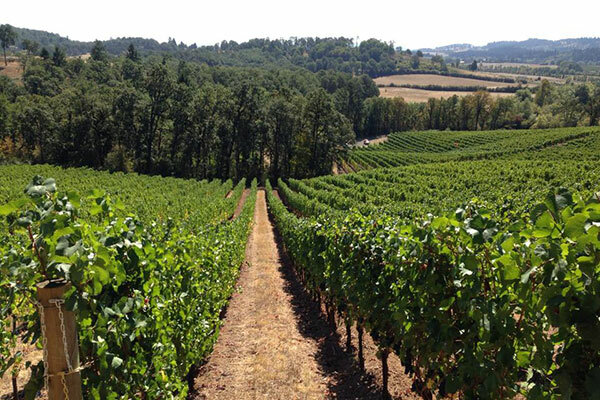 The winemaking philosophy is to start with beautiful fruit from some of Oregon’s premier vineyards and then gently guide the grapes through the fermentation. 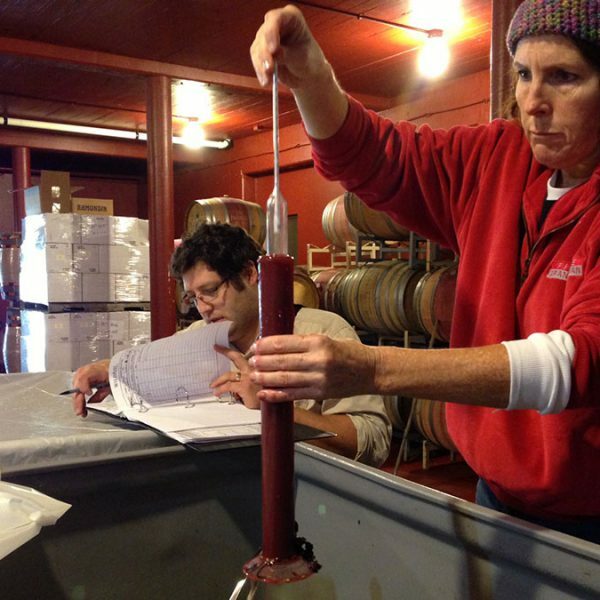 WildAire’s small size allows them to pay careful attention to every detail of the winemaking process. By constantly tasting and evaluating the wines during their lifespan in barrel ensures that the wine is absolutely the best that it can be. 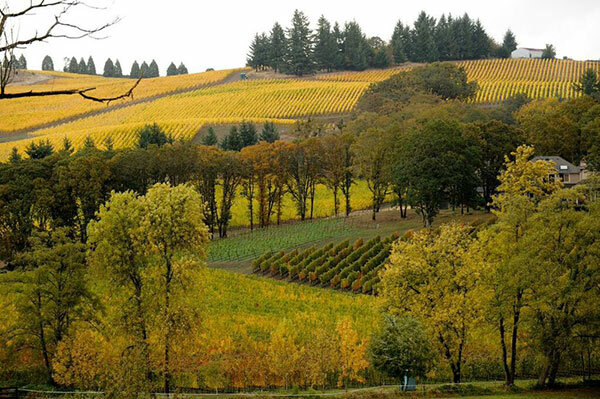 All of the wines are aged in French Oak barrels with about twenty to sixty percent of them new for each vintage. Matthew Driscoll was born in North Carolina, raised in the southeast, and has lived in North Carolina, Ohio, and Virginia before settling here in Oregon. After attending Longwood College and Virginia Commonwealth University (VCU), he started his own construction business in Virginia in 1988 and soon realized that it was incredibly difficult to enjoy wine while nailing walls together. That led to a new career path in Geographical Information Systems (GIS) where he spent 10 years working for various Engineering and Mapping companies. 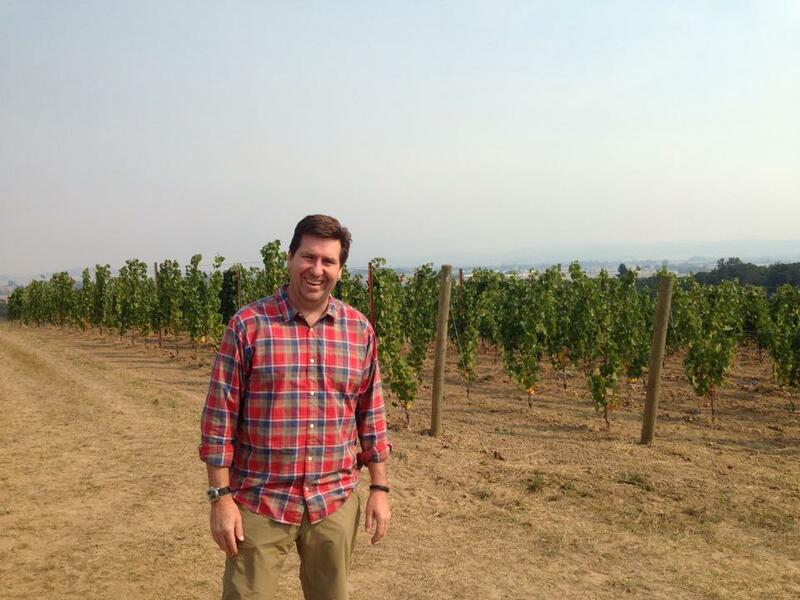 In 2000, Matt began a new career that would lead him to the promised land of the most beautiful grape in the world, Oregon. 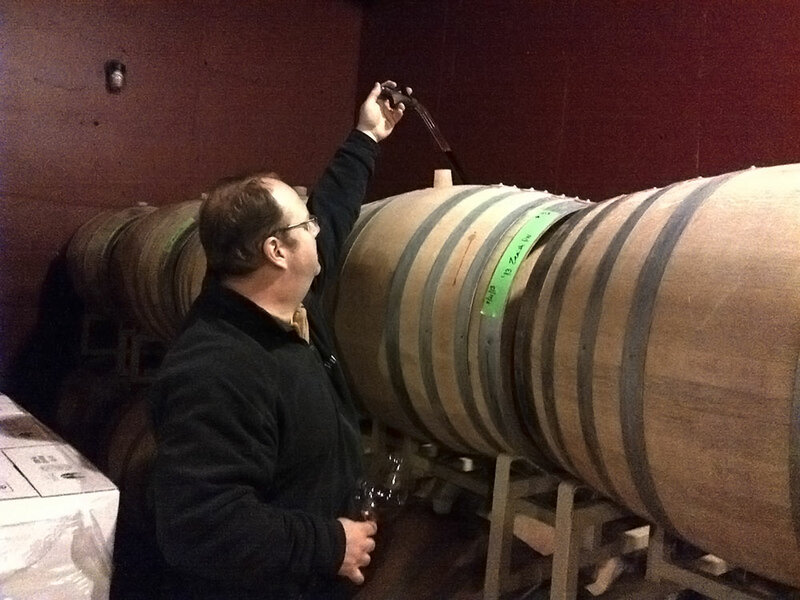 After enrolling in the Enology and Viticulture programs at the Northwest Viticulture Center, Matt got a job working harvest as a greenhorn cellar rat at a winery. 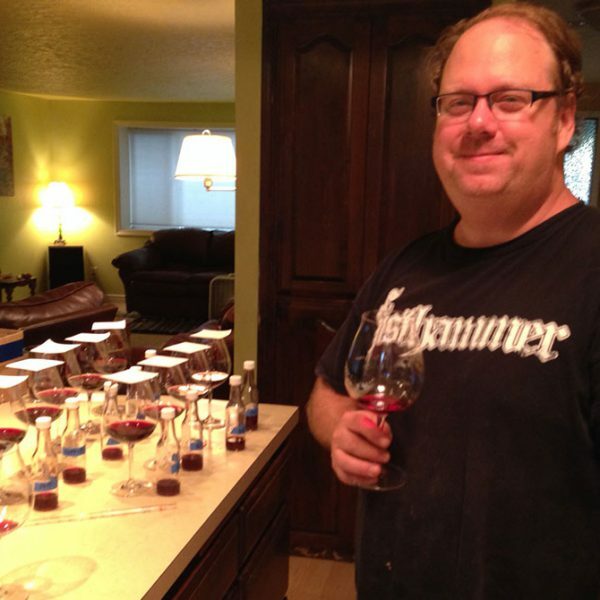 Since then, he has developed his craft by working at some of the best wineries in the valley. 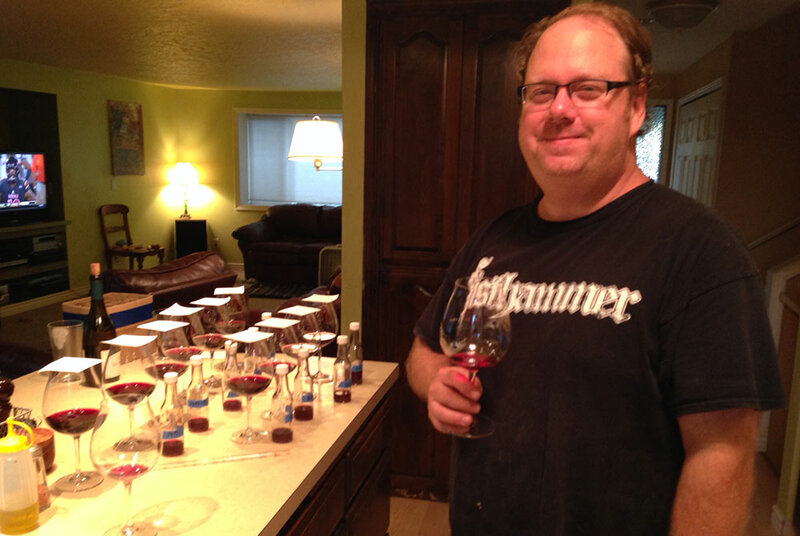 In 2005, Matt became the Co-Founder and winemaker for WildAire with the hopes of making world class Pinot Noir. Jean Driscoll is a born and raised army brat. She finally found the group of friends she had been searching for in Richmond, VA, where she completed her BS, Information Systems, at Virginia Commonwealth University (VCU). While in Virginia, she pursued her career of supporting business software on midrange computer systems and hung out with the best buds on earth. Through this group she met her husband, Matt. With this group of friends and both of the families in attendance, they married in Nags Head, NC. 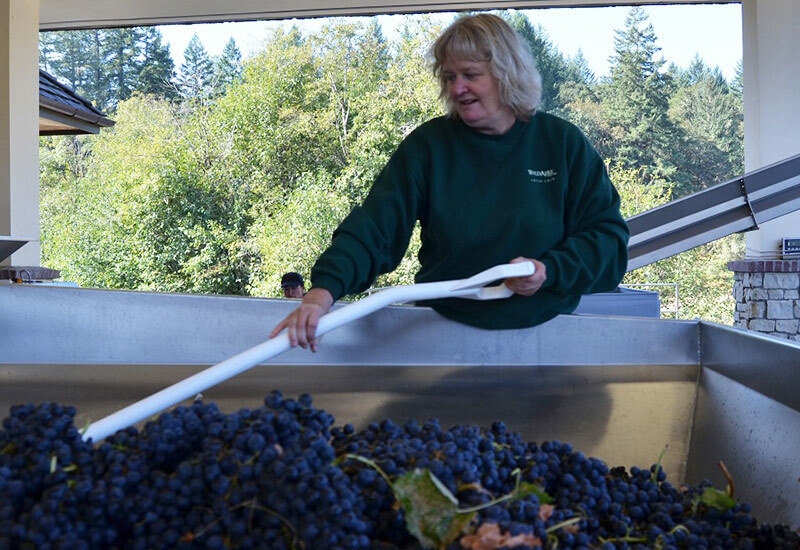 One of her bridesmaids lives in Amity, Oregon and it was after visiting her in 1995 that Matt and Jean determined to come live in the Willamette Valley and produce Pinot Noir. Jean enjoys business trips back to Virginia and Pennsylvania, to share their wine. Anne Driscoll Nesbitt was born in Winston-Salem, NC and raised in Richmond, VA and is the oldest of Matt’s three sisters. Also a graduate of VCU with a degree in Communications, Anne began a career in the media as the Director of Programming for WRLH Fox 35 in Richmond. Anne has since raised 4 beautiful daughters who have made it to college and beyond. Hence her appreciation for wine! She joins us from the world of Contracts and Grants at UNC Chapel Hill and she now resides in Winston-Salem as our National Sales Manager for WildAire. We are super lucky to have Anne partnering with us as she is incredibly loyal, fierce, laughs all the time, drinks our wine constantly, hikes, and loves the Pacific Northwest. Amy Driscoll was born in Asheville, NC and raised in Richmond, VA and is one of Matt’s three sisters. After graduating from Catholic University with a degree in Music, Amy began a career in the business world as a graphic artist in Washington, DC. She has since kept up her musical chops on the cello and frequently plays in symphonies and quartets in the DC area. Currently an Art Director, Amy is the mastermind behind all of the bottle labels, logos, and business cards for WildAire. Her vision and expertise is what makes all of our packaging look so sharp. Plus, she’s family! That makes it even more special! 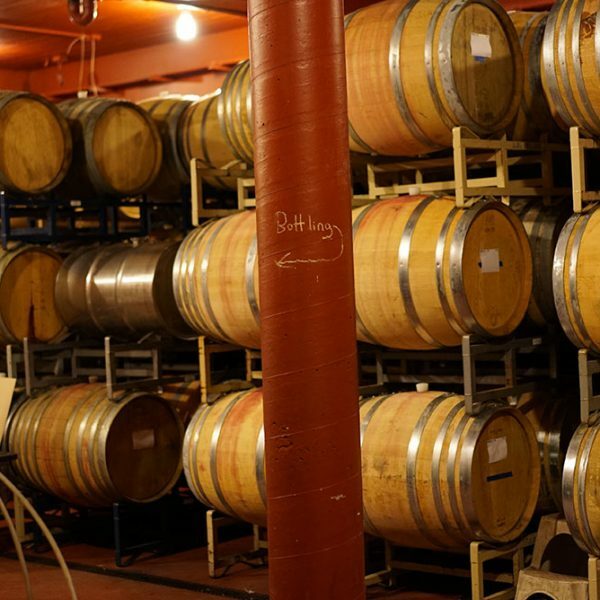 Our philosophy in the cellar is to gently guide the fruit through the fermentation process and into barrel. 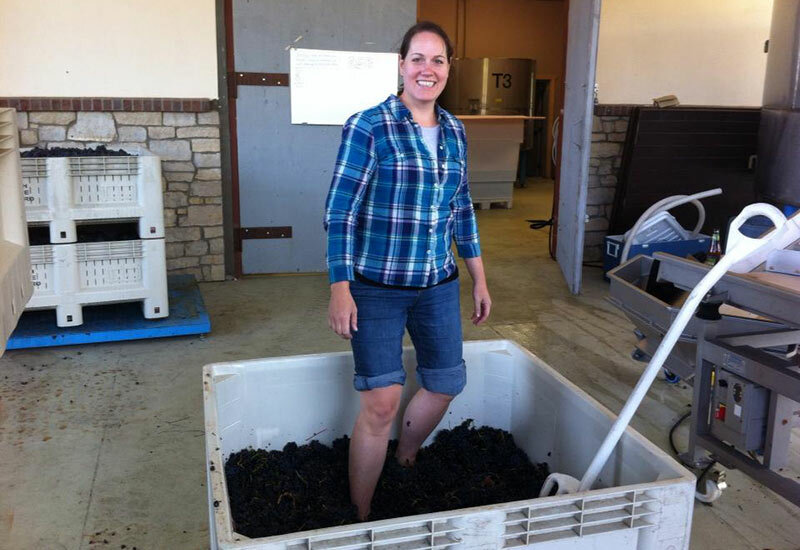 That being said, our winemaking style isn’t really a style per se. 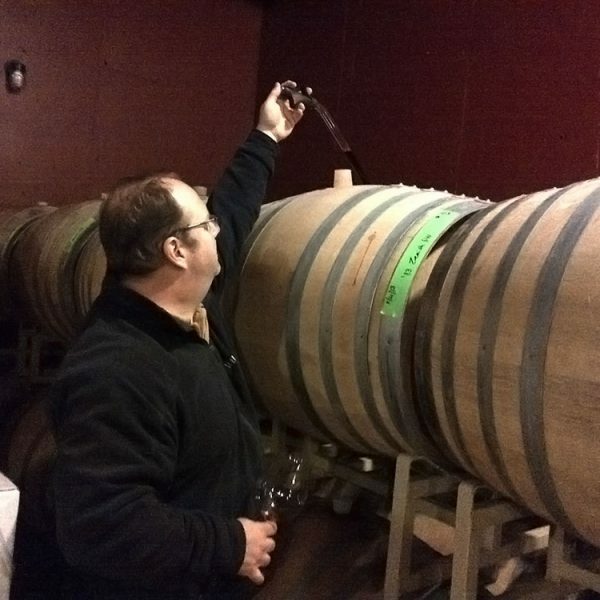 We routinely tweak our winemaking protocol depending on what the vintage gives us and constantly experiment with new techniques and equipment. There is no absolute, perfect way to make wine due to the dizzying array of variables that we face every year. You can’t make wine from a recipe. You’ve got to be intuitive and listen to what the grapes are telling you when they show up at the door and react accordingly. However, there are some constants that ring true in the way that we treat the grapes during harvest. 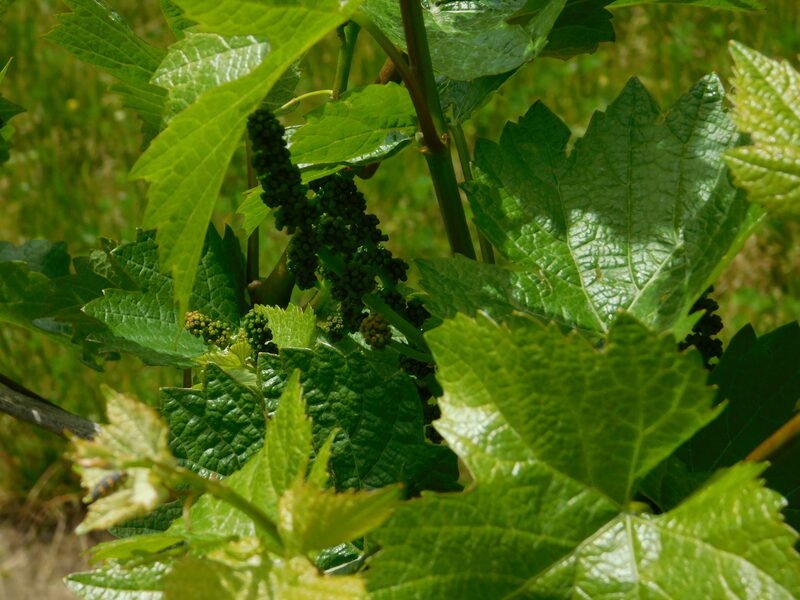 For Pinot Noir, the grapes will be destemmed slowly and not crushed to get as many whole berries in the fermentation as possible. 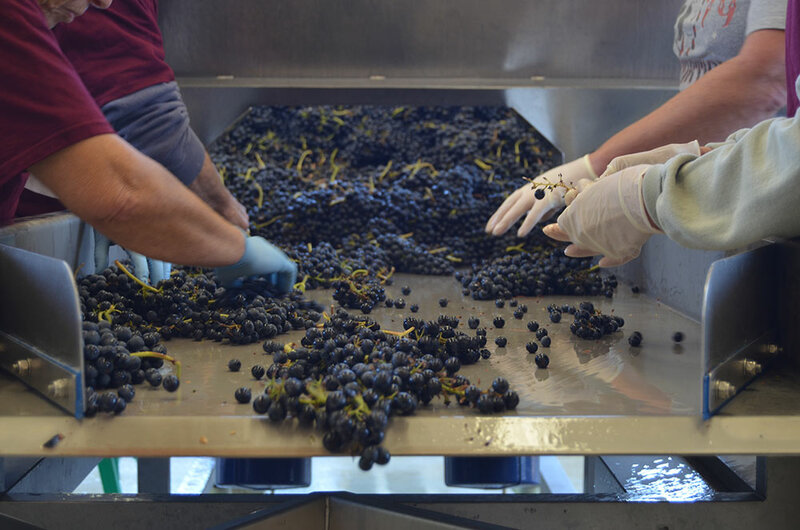 Depending on cluster maturity, some lots will get a percentage of whole clusters added to the destemmed fruit and dry ice to help reduce the temperature. Sulfur is added at the crusher to the fruit at very low levels if it looks clean and disease free. 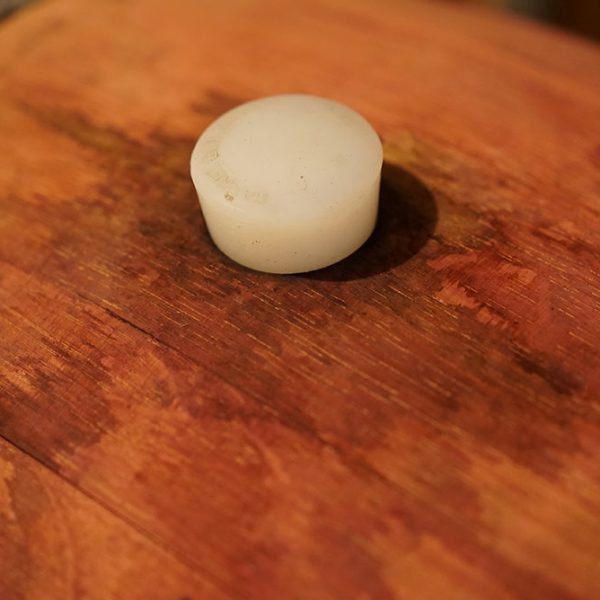 We want to help the native yeasts take control of the fermentation as they create more complexity in the finished wine. We cold soak our fermenters for as many as 7 days at a temperature of 45 to 50 degrees. This helps to gently extract color and tannin from the skins in an environment without alcohol. Pinot Noir also has a habit of racing through the fermentation. In fact, I’ve seen a fermentation crank thru 12 brix in just one night. Cold soaking gives you the time to make sure that you get what you need from the skins and that the temperature rises slowly for a nice and even fermentation curve. The cap of grape skins that floats up to the surface in the bin has to be re-submerged on a daily basis.”Punchdowns” are all done by hand. This process is very labor intensive, but it also creates an intimate relationship with how the grapes are progressing through the fermentation. After the cold soak is over, each bin is warmed up slowly and inoculated with our Pied de Cuve that we have started offsite from the prior week. When fermentation begins punchdowns increase to 2 times per day, with an occasional, gentle juice pump-over through a screen, only as needed to cool the fermentation and give the yeast a boost of oxygen. 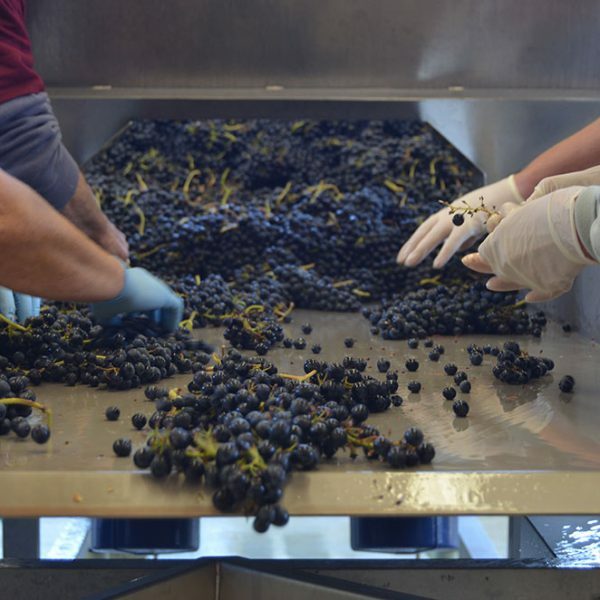 The punchdowns will then decrease as the fermentation ends so that the new wine won’t become over-extracted with tannins in a high-alcohol environment. 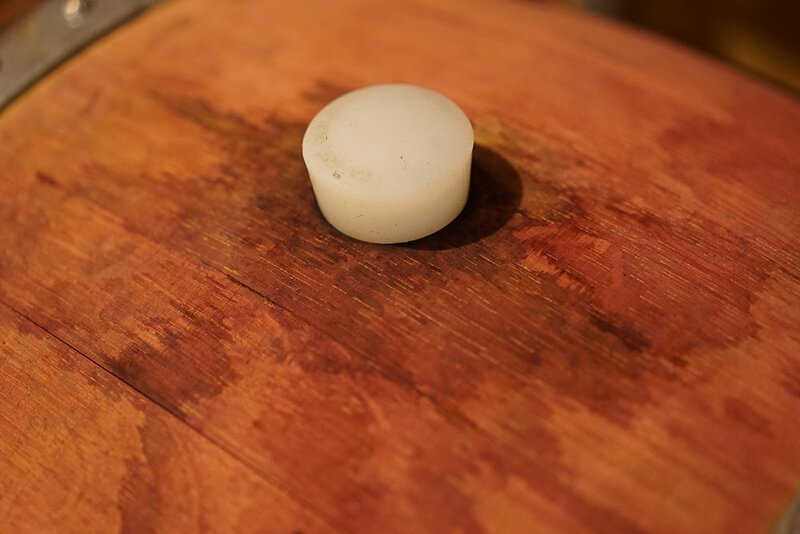 The newly fermented wine and its solids are allowed to sit in tank for 10-20 days of extended maceration, a period during which the tannins soften and the primary fermentation esters develop more complexity. Total time on skins for our Pinot Noir averages from 25 to 30 days. The new wine is then pressed off to tank for 3 to 5 days to settle and then moved to barrel. 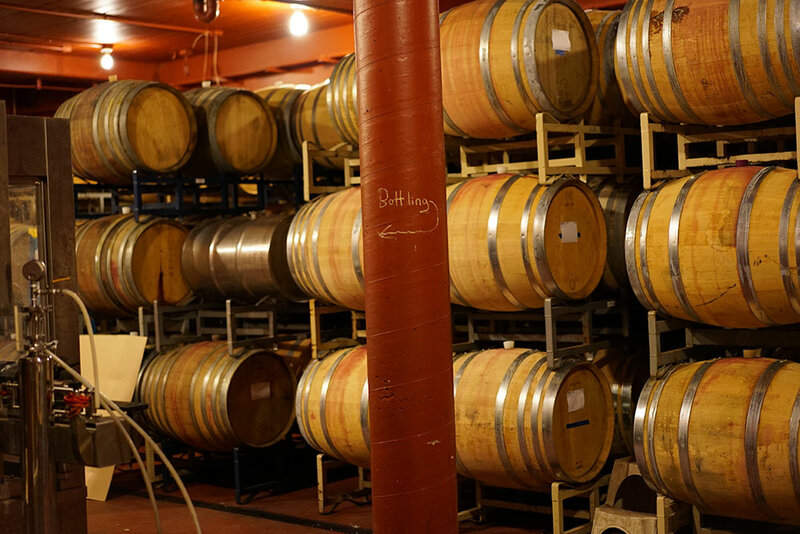 Our Pinot Noir barrels are all 3-year air dried French Oak barrels from various forests in France. About 10% to 60% of these barrels are new, depending on the structure of the new wine. For Chardonnay, the hand picked clusters are tread upon by our crew in quarter ton picking bins and left to soak overnight to extract aromas and flavors from the skins and stems. We then gently press the CH in the morning to avoid releasing any bitter phenolics trapped in the seeds. Pressing occurs in stages with increasing pressure steps over the course of 90 minutes. The stems help the juice drain from the press by creating spaces in the cake for the juice to fall into the press pan. The juice is racked from the press pan to a chilled settling tank with no addition of sulfur to pre-oxidize the juice to create what we call “Black Chardonnay”. The cold and very brown juice is racked to barrel the next day. 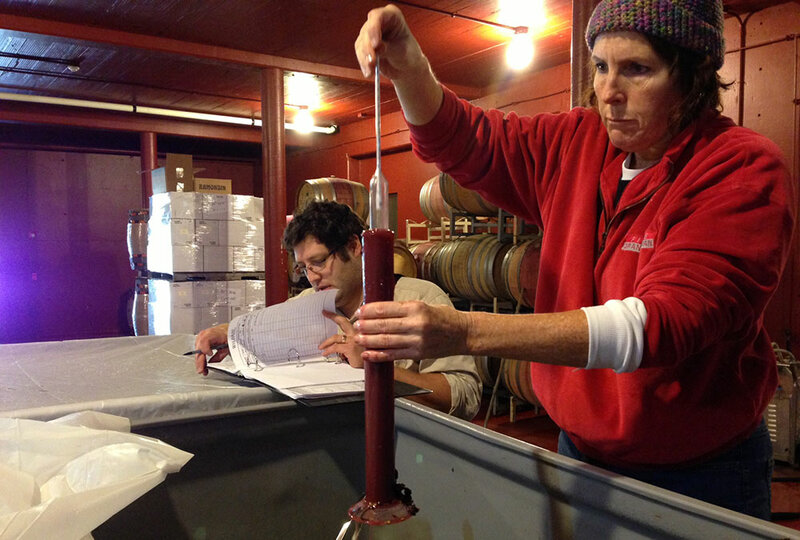 We inoculate each barrel with our Pied de Cuve that we had started the previous week offsite. We like to begin our fermentations with wild yeast from the vineyard instead of the dominant strain that lives in the winery. It takes about 2 days before we see signs of fermentation beginning and then it usually takes another 12 days for the new wine to become dry. We use about 20% new french oak for our Chardonnay as we don’t want to overpower the wine with new oak. The oak should serve as a pedestal to place the fruit upon, and not to cover it up. We strive to create Chardonnay with fresh acidity and minerality while still capturing those primary fruit aromas. Stirring the lees helps create a softer mouthfeel in the finished wine to offset acidity and bitterness. Malolactic fermentation (also called secondary fermentation or ML) of the wine naturally occurs in barrel and converts the sharper tasting Malic acid to the softer Lactic acid and is normally done to completion on all of our wines. 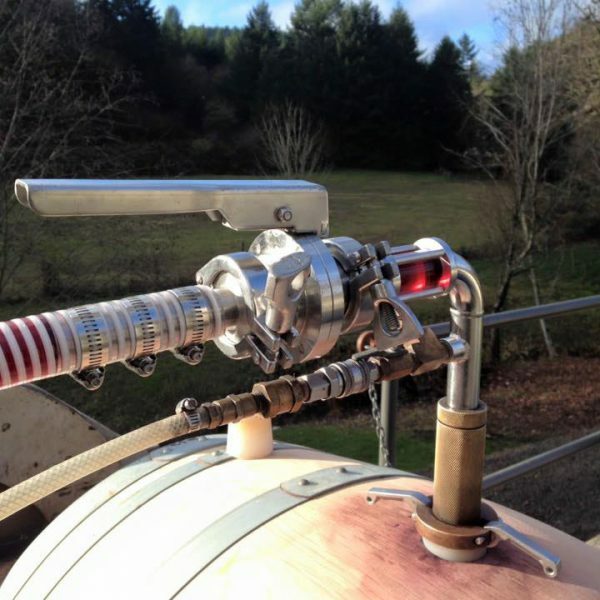 When ML is complete, the wine gets it’s first dose of sulfur dioxide to kill any micro-organisms and also to protect the wine from oxidation. All of our wines age on the lees until they are ready to bottle. They are never racked from barrel during this time in order to protect their delicate aromas. 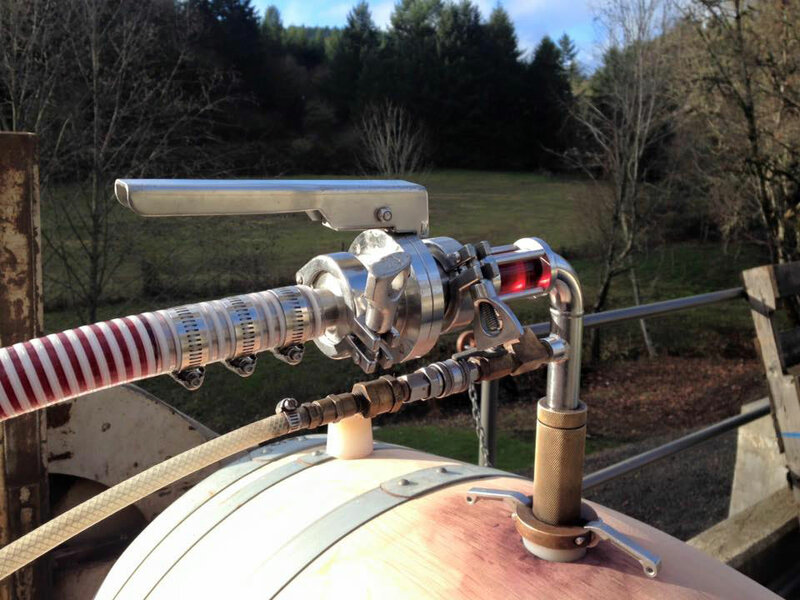 After barrel aging,the wine is transferred out of the barrel using inert gas to gently push the wine into tank with minimal oxygen exposure. Typically, the wine will stay in tank for one to three weeks before it’s bottled. We normally bottle age our red wines for about 6-12 months before releasing it to the public to let the wine become accustomed to it’s new surroundings in bottle. These ideas are all aimed at preserving the flavors and the aromas of terroir and the nuances of each vintage. 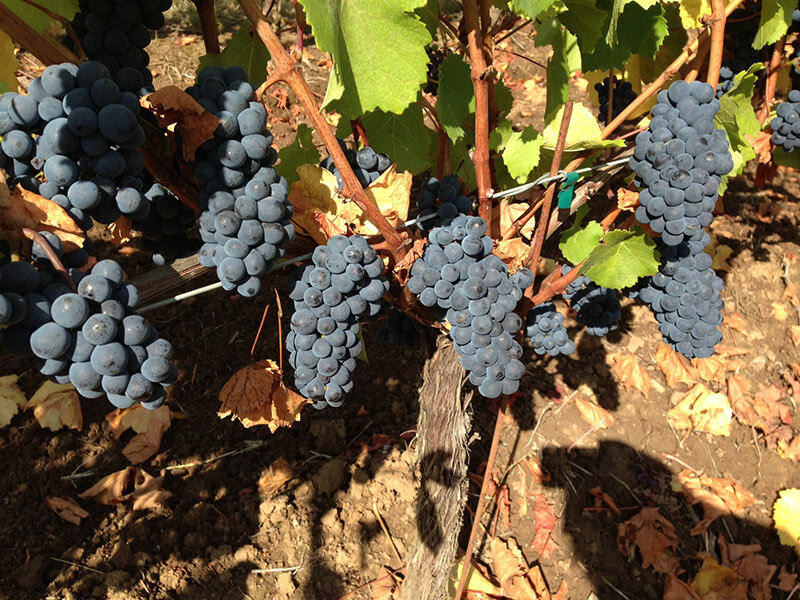 Pinot Noir shows this like no other grape does with its delicate complexity. Each bottle is like a sliver of time that’s slowly evolving, capturing the essence of the vineyard and the vintage.